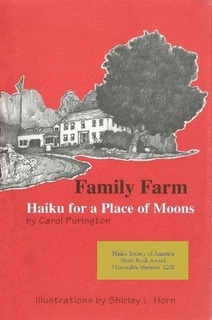 Family Farm: Haiku for a Place of Moons is again available! The 1999 first edition has been out of print for several years. Reprinting at first looked overwhelming. The original press had closed without saving plates, and it seemed impossible to reproduce Shirley Horn’s outstanding illustrations. Years pass and technology changes. Thanks to the cooperation and generosity of many people, beautiful copies are once again available to purchase at the Lulu and Amazon online retailers. This collection of over 300 haiku follows the seasonal cycle of life on a New England dairy farm. It is divided into thirteen parts - the twelve months and Christmas - with each part bearing a Native American name for that month's Moon. 30 black-and-white illustrations.